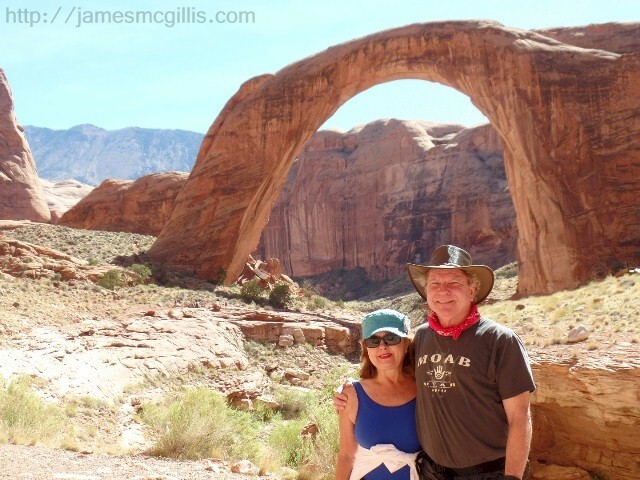 In early October 2016, Spokesmodel Carrie McCoy and I traveled to Page, Arizona. 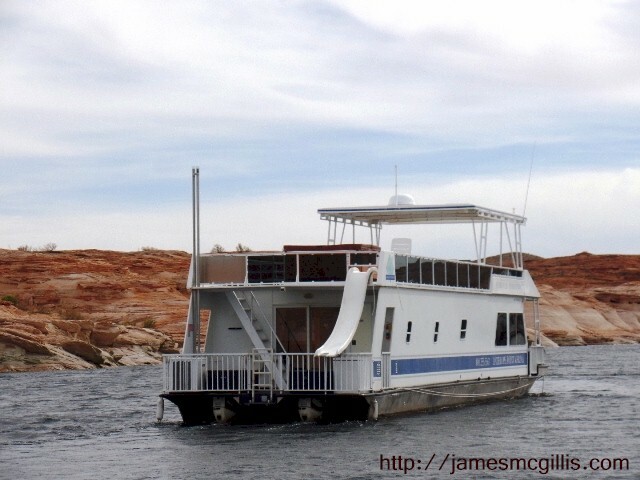 From there, we embarked on a four-day, three-night houseboat excursion on Lake Powell. 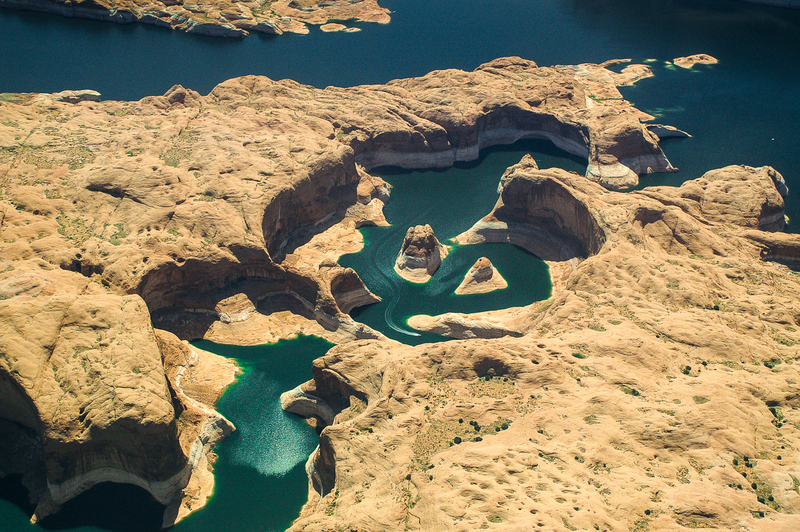 Although Antelope Marina is in Arizona, the upper reaches of the lake are in Utah. When congress created what would become the Western States, no one thought to use watercourses as more natural boundaries. Hence, we now have the “Four Corner” states. Our first day on the water consisted of navigating our seventy-foot houseboat “up lake” (or up river, as it had once been). 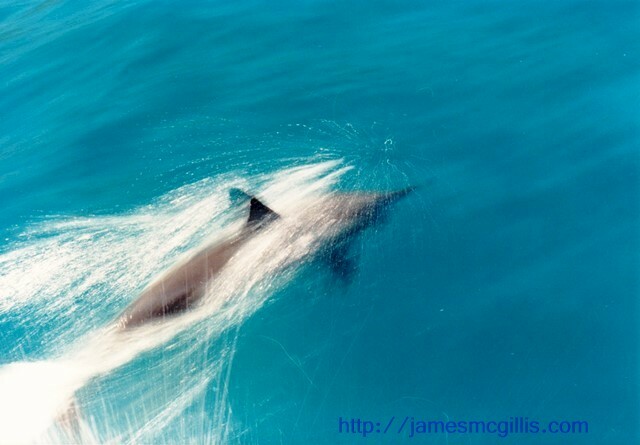 Trailing behind us on a line was a twenty-six foot powerboat. After traveling almost twenty-five miles upstream, we beached the large craft. With the churning motors keeping us against the shore, we set out lines, and anchored into the sandy beach. Then we relaxed and enjoyed nightfall aboard our luxury houseboat. 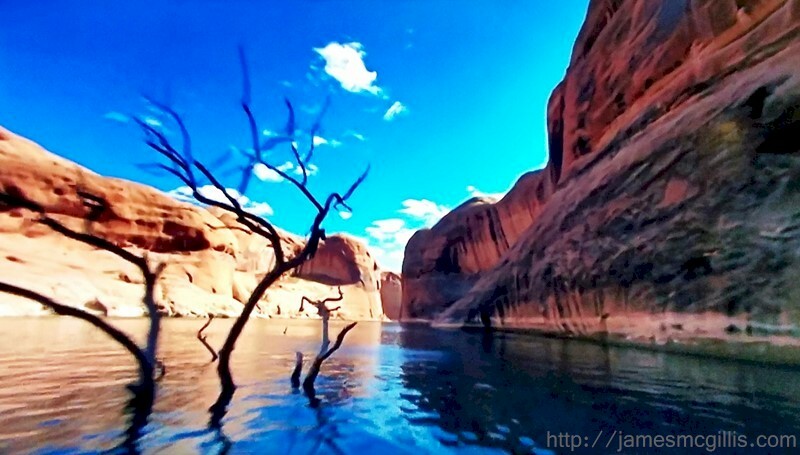 The next morning, we boarded our powerboat and proceeded upstream to explore Lake Powell and its side canyons. Our initial destination was Rainbow Bridge National Monument, which is one of the “Seven Wonders of the Natural World”. The stone arch of Rainbow Bridge itself is enough to strike wonder into the heart of any sighted visitor. Even with a 250-hp. 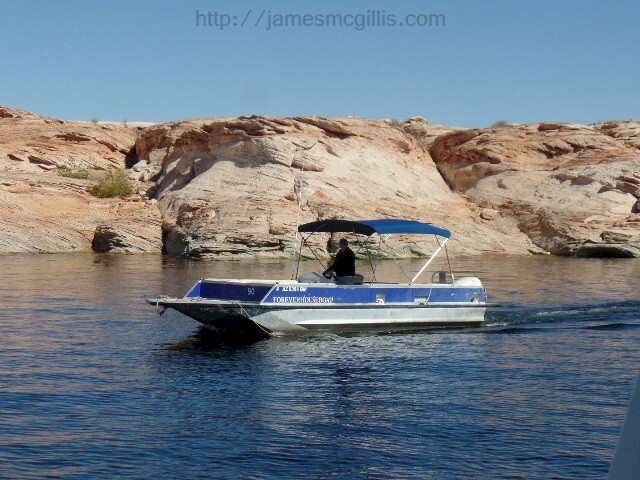 Evinrude outboard motor to propel us across the water, time and wave action made the trip seem interminable. As we sped along the middle reaches of the lake, it was a harsh ride. While navigating the red and green channel markers, we spotted a small houseboat with flags and banners flying in the wind. As we approached, we saw two small boats and a kayak circling around something in the water. As we sped past, our hull pushed a bow wave toward the flotilla. Looking over, I spotted someone within that circle of boats, swimming downstream. I was too dumbfounded to take a picture, so there is no evidence of that sighting. After spending a couple of hours at Rainbow Bridge, we returned to our houseboat, perhaps twenty miles downstream. As we progressed, we came upon the same flotilla of boats and again could see someone in the water, swimming downstream. Before a filet mignon barbeque dinner on our houseboat, the three of the couples who were aboard with us enjoyed our top-deck spa. Then, we repaired to our four separate cabins for a restful night floating on the lake water. 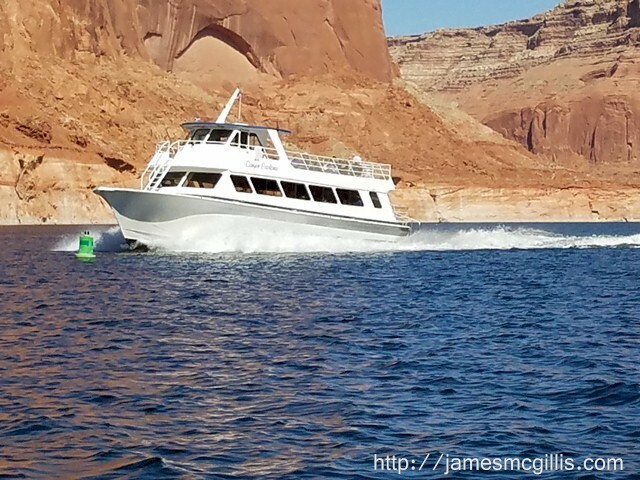 The next day, we again took our powerboat upriver to see Reflection Canyon and Cathedral Canyon, which are two of the most scenic side canyons in the vicinity. As we blasted up river in our powerboat, we came across the little flotilla of boats we had seen the previous day. Nothing had changed except their location. With a swimmer still in the water, the whole group was now farther downstream. 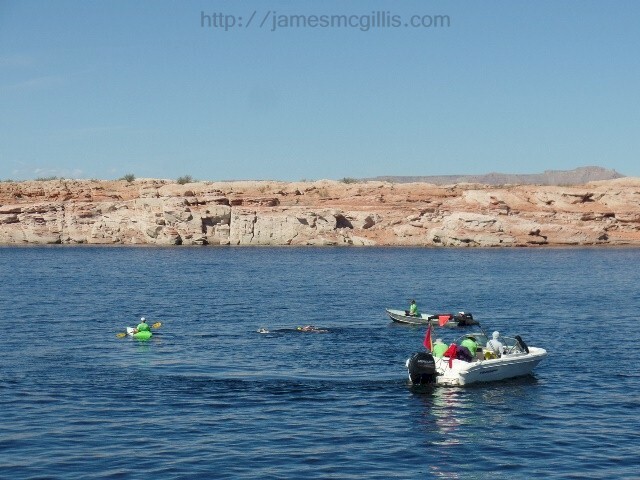 During our return to the houseboat on that second day, we again (you guessed it) overtook and passed the flotilla of small boats and its encircled swimmer. Upon return to our floating condominium, we enjoyed a third evening of festivities, including Carrie and me having the top deck spa to ourselves. Despite a wind change, we again had a restful night aboard. After a hearty brunch on our final morning, we shoved off and piloted the big houseboat down river and back toward Antelope Marina. As we entered the final few miles of our journey, we came across a group of small boats. 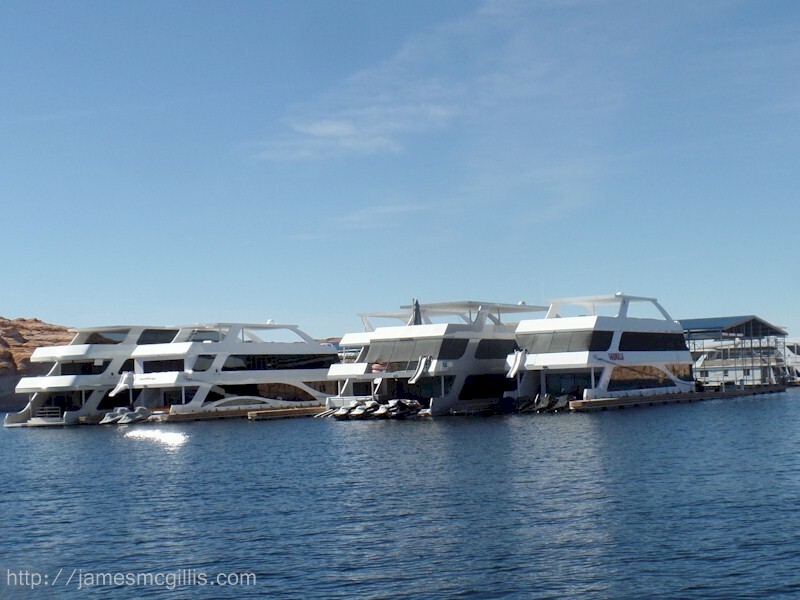 Although the houseboat had departed, there were still several small boats surrounding a swimmer or two in the water. Although there was now a second swimmer pacing the first, I recognized the same black swimsuit we had seen for the past several days. At that moment, I realized what was happening. 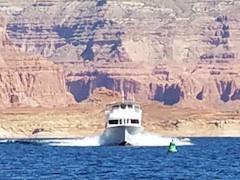 Someone was swimming the length of Lake Powell, without a stop. From where I stood on the upper deck, I shot one still photo and twenty-six seconds of video. After three days of disbelief, those two shots were all the documentation that I acquired of an epic swim. 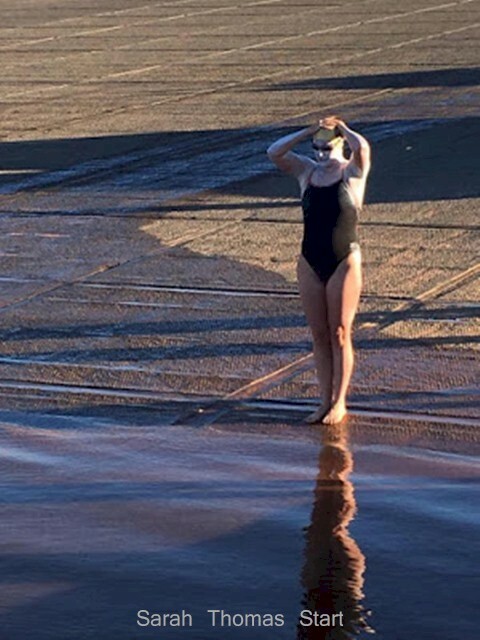 As it turned out, we had witnessed Sarah Thomas breaking the world record for an unassisted marathon swim. 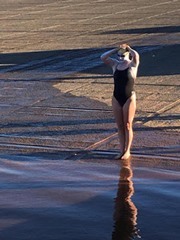 Later, national news reported that Sarah had swum eighty-two miles in fifty-six hours… without stopping or getting out of the water. As spectators, we watch Olympic swimmers compete in contests up to 1500 meters. To put Sarah Thomas’s accomplishment into perspective, her eighty-two mile swim equals 131,966 meters, or eighty-eight times the length of the longest Olympic swim race. During her quest, Sarah Tomas survived on twice-hourly liquid carbohydrate drinks. For almost two and one half days, Sarah swam, never touching a boat, a rope or a human hand. Congratulations to Sarah Thomas for accomplishing her amazing “new energy” swim. 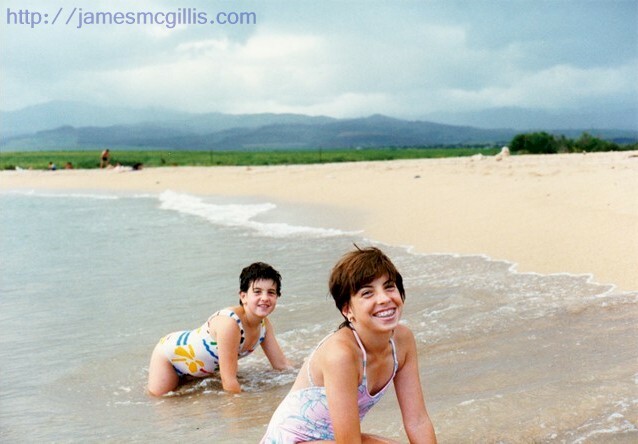 In 1988, I vacationed with my daughters Tracy and Robyn in Kaua'i, Hawaii. At the time, they were thirteen and ten years old. 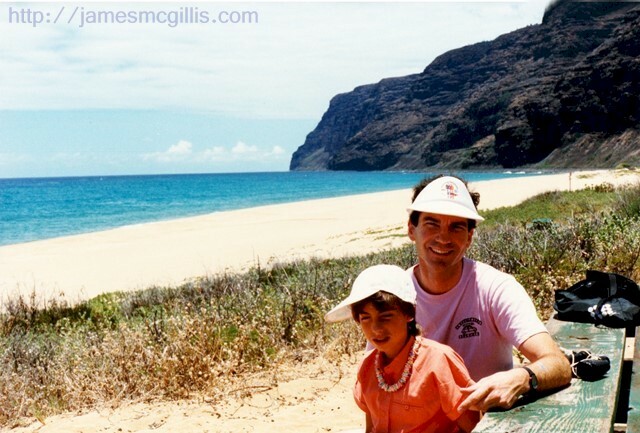 Airfares were inexpensive and my father, Dr. Loron McGillis arranged for us to stay at a friend’s Poipu Shores condominium, on the south side of the island. We had a week on the island and planned to make the most of our time and available funds. 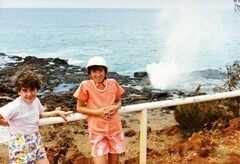 On the morning of our first full day, we drove west, stopping first at the famous “Spouting Horn”. 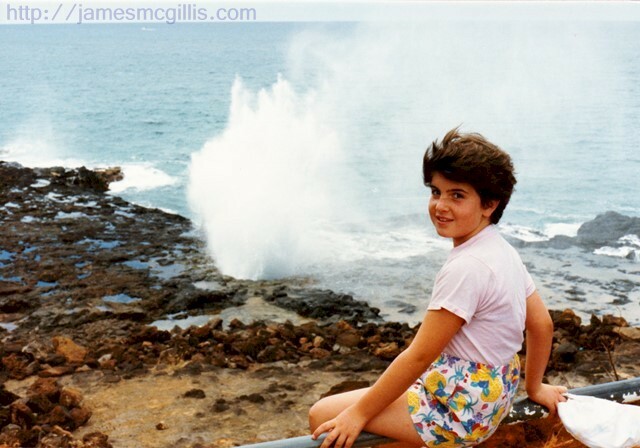 Near the shore, on a lava bed, was a blowhole. There the surf would fill a void in the lava rock and spew seawater up and out like a humpback whale, spouting in the sea. My guess is that as the hot lava flowed, the surf crashed in, creating the void before the lava could cool. Now, tens of thousands of years later, the surf still surges and the water and wind make a whooshing sound like no other. 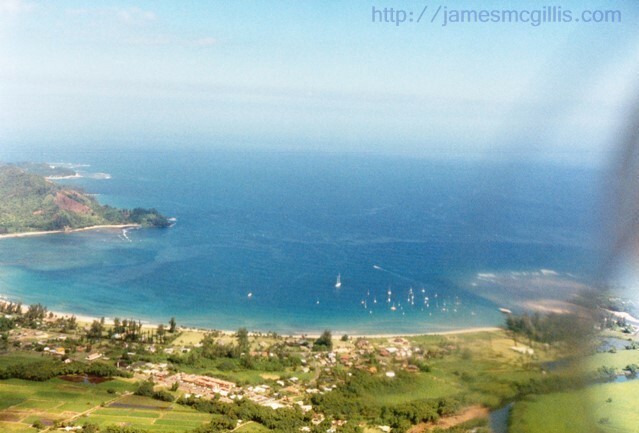 After passing through Waimea Town, we drove toward the southwestern end of the island. We were heading to Barking Sands Beach at Polihale State Park. 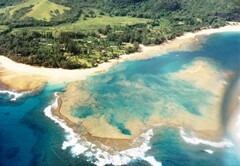 While the North Shore of Kaua'i is often cool and wet, this windward beach was hot and dry. With a deserted seascape before us; the wind blew onshore. As we walked, friction between the porous grains of sand amplified the sound, creating the barking sound that we expected full well. To me it sounded more like crunchy cereal, but my faded memory of that moment is now twenty-seven years old. 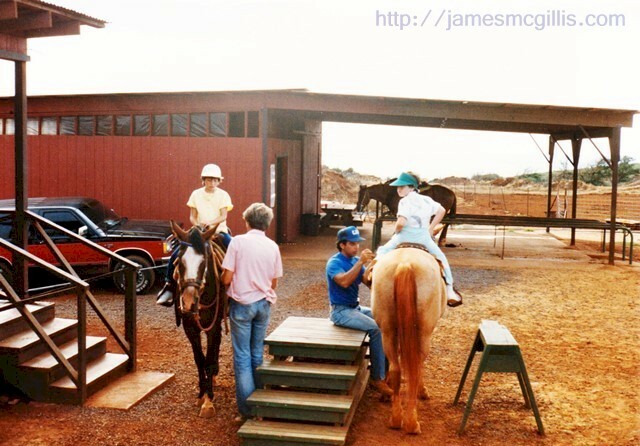 The next morning, we set out for the north side of Poipu to ride horses at CJM Country Stables . 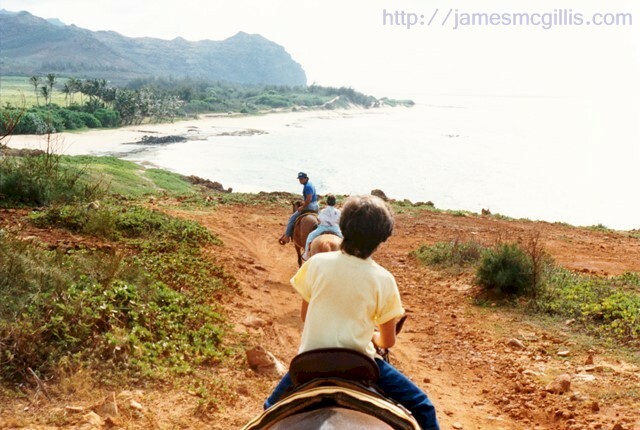 After saddling up, we rode in a line toward Māhāʻulepū Beach. There, we enjoyed unspoiled vistas and crashing surf. Several years later, developers built the Grand Hyatt Kauai Resort on that beach. 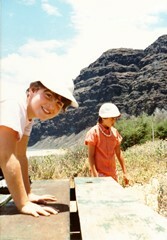 As we crested the hill in 1988, the old Gillin Beach House was the only structure in sight. 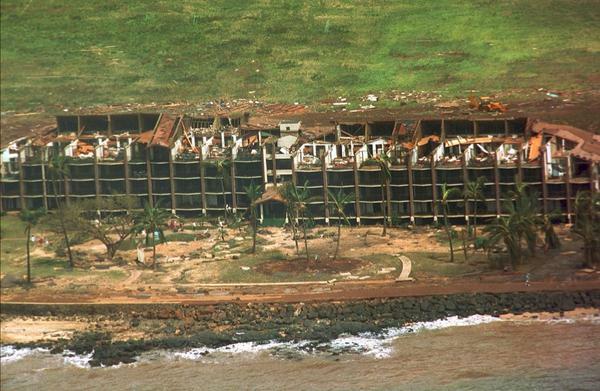 In 1992, Hurricane Iniki hit Poipu, causing lasting destruction to homes and businesses. Beach-side amenities at the Grand Hyatt disappeared under a huge, wet sand dune. Had Apukohai, the Shark God of Kaua'i taken revenge against the destruction of such a beautiful natural area? 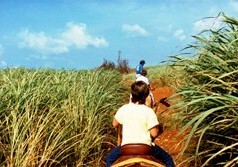 While on our return trip to the stables, we rode through cane fields and could smell the pungent odor of a nearby sugarcane mill. 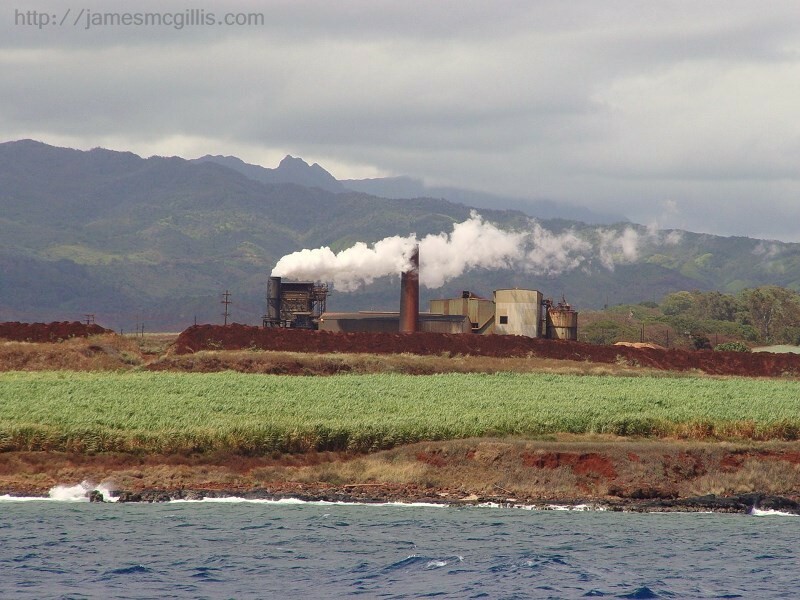 Twenty-one years later, in 2009, the last sugarcane mill on the island closed for good. 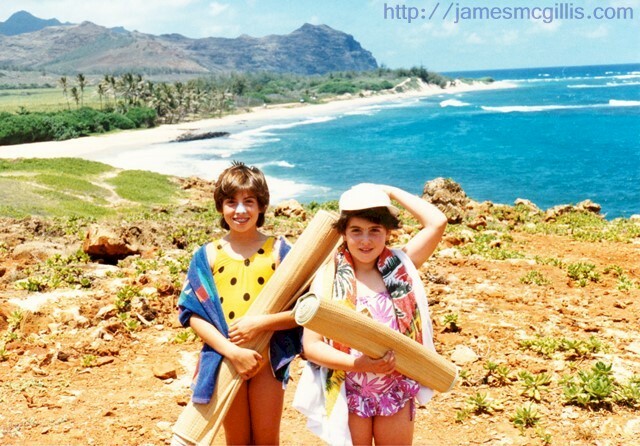 The following day, we headed north, to Princeville. 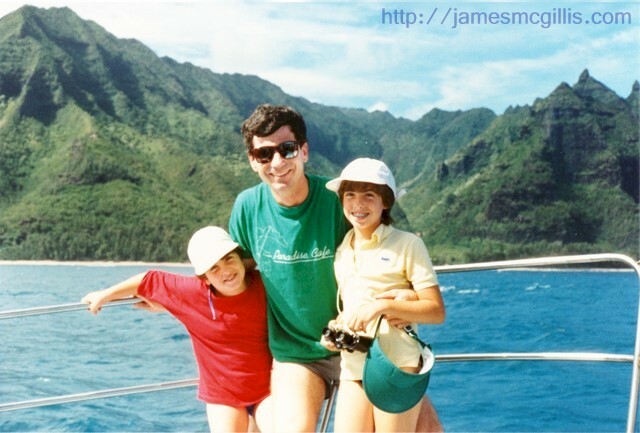 There we boarded a large motor yacht and set out for the Na Pali Coast. As our boat cruised at high speed, we stood at the bow and tried to warn the captain whenever we saw a sea turtle sunning itself in our path. With spinner dolphins riding our bow wave, the time clicked by. Soon, we arrived at the entrance of a large sea cave, cut into the wall of a cliff. There we spotted intrepid tourists, riding on the side-tubes of inflatable boats. Overloaded for the conditions, they were rocking in the surf. I was happy we had opted for the larger boat. After waiting our turn, our boat entered the sea cave, known as “The Bright Eye”. After a dark entry, we soon discovered that the interior of the cave was open to the sky. By this time, we had rocked and rolled in the surging ocean for quite some time. After eating lunch, Robyn said that she was not feeling well. As happens on so many coastal voyages, her lunch did not stay down. After alerting the crew, they entered into a familiar drill, cleaning everything up in less than two minutes. I had a feeling that they had done this before. The moral to the story is to take a Bonine tablet in the morning, before your voyage. As Robyn had learned, it is “better to be safe than sorry”. Undaunted, but chastened, on the next day we headed for the benign surf at Salt Pond Beach Park, just west of the Port Allen Airport. The red clay there, inland from the surf line comprises acres of salt flats. Over millennia, the surf sometimes flows inland on a storm tide. Trapped there, the salt water evaporates, leaving a salt bed. To this day, natives of the island stake out an area on the salt flats, using small trenches and pits to harvest the rich, natural sea salt from Salt Pond Park. Like a community garden, each harvester respects his or her neighbors. As always on this Earth, abundance creates cooperation. After seeing the beauty of the unspoiled Māhāʻulepū Beach while on horseback, we decided to hike over the hill from our condominium and enjoy another day at that beach. When we arrived, the trade winds blew and the ocean looked impossibly blue. Even in June, the shallow water near shore was cool to cold. Since the tide was out, we decided to build a sand fort that could withstand any wave… or so we thought. Once again, with the entire beach to ourselves, we built higher and higher, until the tide turned and swamped our fortress. That is the way of all sand forts. You build, you enjoy and then the Shark God takes them away. 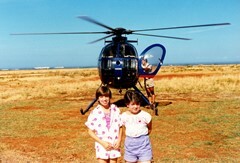 Our next day, we were off to Waimea Canyon, west of Poipu. From sea level, we took a road that climbed straight up a ridge, then turned into switchbacks and then again up another ridge. This went on for quite a time, until we crested yet another ridge and saw the Grand Canyon off to our right. The Grand Canyon… what was it doing here on Kaua'i? Last time I visited, it was in Arizona. Then I discovered that the Menehune had dug this version of the Grand Canyon. I have to give them credit. It is a good copy of the original. 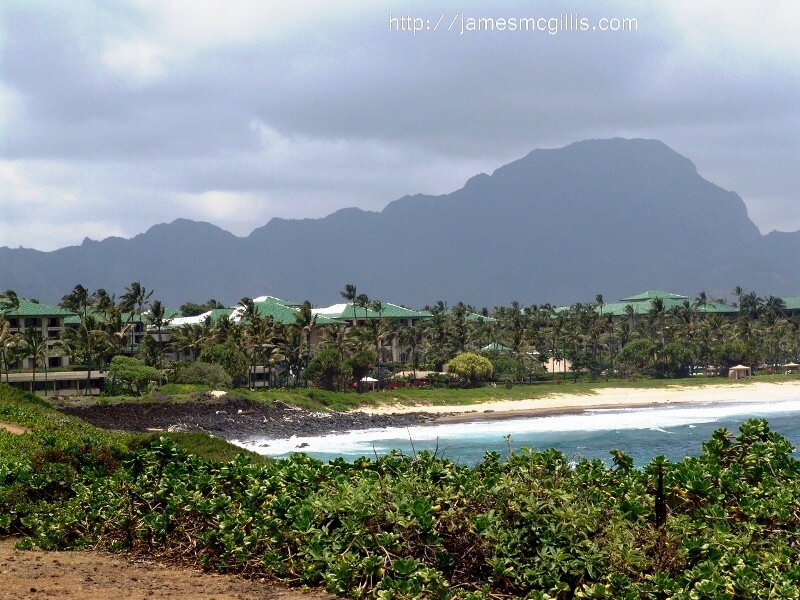 No trip to Kaua'i is complete without a visit to Brennecke’s Beach at Poipu. Although there is always a crowd, the beach itself never seems overcrowded. The water is warm, the waves are gentle and the place is family friendly. After swimming, you can use the freshwater shower and head for Brennecke’s Beach Broiler, right across the road. 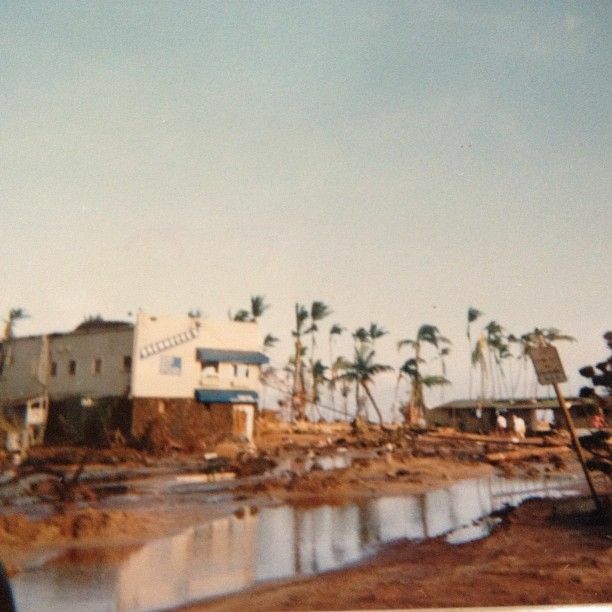 In 1992, Hurricane Iniki partially destroyed the restaurant, but it was rebuilt and lives again in Kauai history. There, you can sit upstairs and look out over the beach park and enjoy lunch or Champagne at sunset. 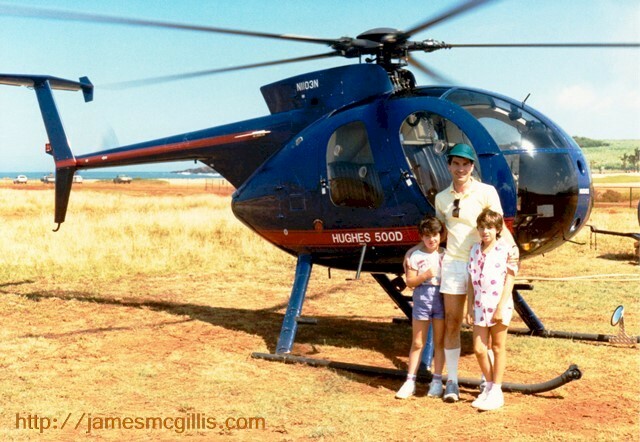 Although it costs a lot more now, in 1988, a helicopter ride for the three of us was only a few hundred dollars. 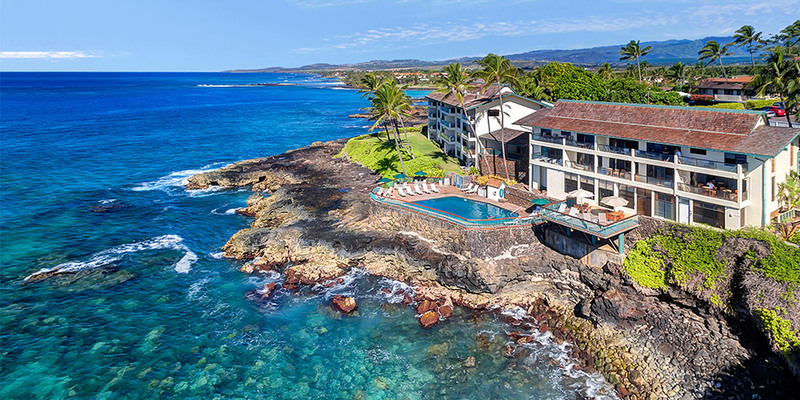 In an hour or so, we saw all of the places we had visited earlier that week, including the cane fields, Waimea Canyon, Barking Sands Beach, the Na Pali Coast and even the extinct volcano that is Mt. Wai'ale'ale, also known as the second wettest place on Earth. Since half of the volcano had blown away in the distant past, we were able to fly “inside the mountain”, even having a waterfall drop a stream of water on to our helicopter. 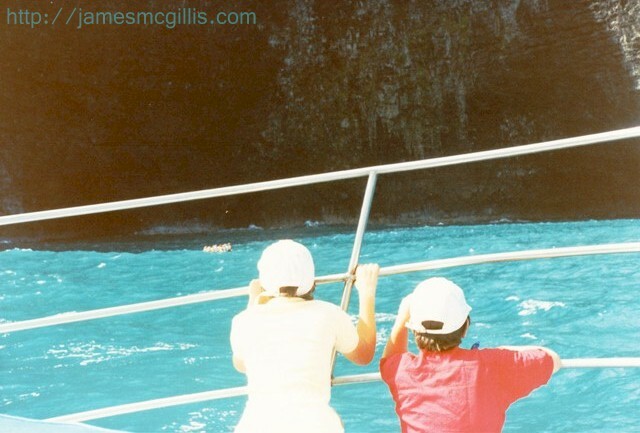 As with our boat trip to the Na Pali Coast, remember to take your Bonine well before departure or risk feeling squeamish as you fly. After a week on Kaua'i, my money was running low and it was time to return to Los Angeles. While sitting on a bench at Brennecke’s Beach on our final afternoon, we met a man who had sold everything he owned, moved to Kaua'i and bought a hulk of a boat. He told me that he planned to refurbish the boat and create a sport fishing enterprise. Running low on money himself, had not yet started the refurbishment. As his two small children played, sunburned at the beach, he and asked if I would like to partner with him on the venture. Back home, I had a career, many obligations and a sense of duty to my children and other family members. Something inside me wanted to stay in Kaua'i forever, but my rationality returned and I gently refused his offer. My guess is that the shell of that boat still sits in a yard somewhere on Kaua'i, waiting for the next dreamer to buy it and try to start a new fishing business. 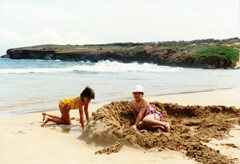 They say that you cannot go home again, but you can always go to Kaua'i and enjoy the time of your life. 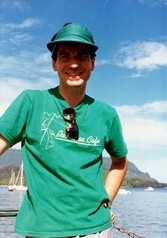 Since 1988, I have returned to the Garden Island many times. Although there is some new development and other amenities, most of what you see here remains as it was, many decades ago. In the past decade, I have purchased Kauaijim.com, Kauaihike.com, Kauaijeep.com, Kauaimist.com, Kauaipage.com, Kauaipeak.com, Kauaisea.com and Kauaiview.com. Please join me as I write about each Kaua'i subject listed above. For over a decade, I have traveled north or south on U.S. Highway 160 in Arizona at least twice each year. 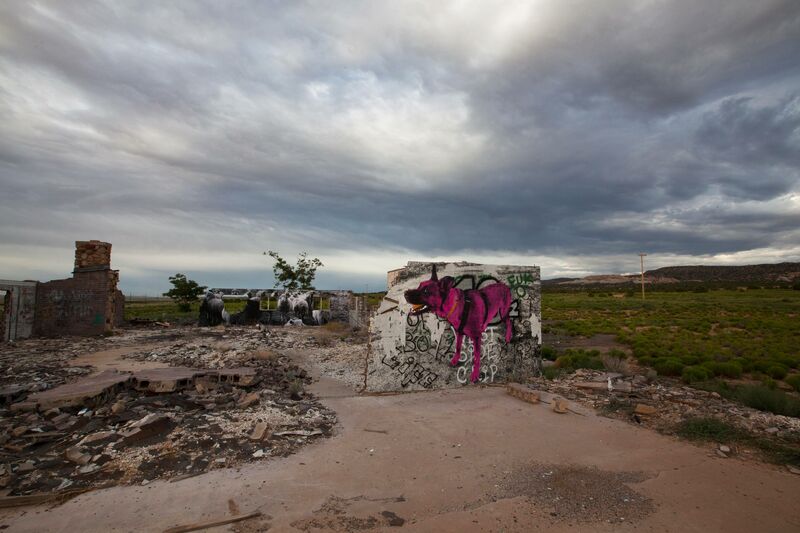 Known also as The Rainbow Trail, the highway closely tracks the trail of the Ancients through Navajoland. On that trail, in Tonalea, Arizona is the Navajo settlement of Cow Springs. Although the closest thing to a commercial establishment in Cow Springs today is the Navajo Nation Head Start preschool, there was once a thriving trading post in the area. When the Arizona Department of Transportation realigned Highway 160 in the 1960s, the new route bypassed the old Begashonto Trading Post. With all of the optimism of that time, the Babbitt Brothers Trading Company moved its previous operation to a knoll beside the new highway. The new building’s construction was robust, with a poured concrete floor and cinder block walls all around. Although similar construction supported the fireplace and chimney, their faces featured Navajo Sandstone. With its large open floorplan, vast wooden trusses supported its roof. Out front, a sign supported by two thirty-foot poles read, “Cow Springs Trading Post”. Apparently, the name was not much of a draw. Sometime later, the owners painted over the original sign. From then until today, it features a brown background and white lettering. The “new” sign presented the phrase, “Standard Oil Products”. Even the lure of brand name petroleum products was not enough to draw sufficient customers to support the operation. At an unknown time, probably in the 1970s, the Cow Springs Trading Post closed for good. Because of its existence in the pre-internet era and its brief existence as a place of business, there are no published pictures of the Cow Springs Trading Post while in operation. In fact, there are no published pictures of the building while its roof still sheltered it. If anyone has such images, we hope that they will publish them. From the images on this page, it is obvious that the Cow Springs Trading Post is now a ruin. What is not obvious, however, is that the landscape there and the artworks displayed on the few remaining walls continue to change over time. Although I had driven by the ruin for almost a decade, I did not stop and walk through the place until 2012. By that time, a local artist who goes by the moniker “Jetsonorama” had created several generations of wheat paste art on the walls. Wheat paste is just what it sounds like. In a bygone era, a concoction of wheat and water supported handbills on temporary construction barriers, utility poles and many other smooth surfaces. Today, artists like Jetsonorama use large-scale printers to blow up digital photos, and then piece them back together on walls such as those at Cow Springs. Although these postings appear permanent to the casual observer, the wheat paste melts in the rain and the paper deteriorates over time. While it is visually arresting art, by its very nature it is temporary. Although I missed some of Jetsonorama’s most famous pieces, I began documenting what still existed of them in 2012. For the past four years, I have returned to see what is new there. Other than the innovative wheat paste art, many of the recent artistic flourishes are spray-overs of more gentile subject matter. Since much of what endures at Cow Springs is graffiti or spray-painted, I also documented its changes, additions and slow fading of several scenes. In order to show how much things have changed in the art scene at the Cow Springs Trading Post, I have organized time-lapse imaging into “animated GIFs”. Introduced by CompuServe in 1987, the animated GIF predates, yet is now ubiquitous on the internet. Most of the moving ads you see on webpages are animated GIFs. An animated GIF is a silent slideshow, using “lossless compression” to limit file size, so as not to slow the loading of a webpage. In order of their appearance on this page, I have titled the animated GIFs as follows: “The Brave”, “The Front Wall”, “The Eagle”, “The Princess and the Sheepdog” and “The Broken Sun”. In 2016, the Brave is now gone, the Front Wall is painted over and the Feather is all that remains from the front wall of a decade ago. Remember is a recent addition to a short section of wall, while the Prophet has been hammered into smithereens. Graffiti has obliterated the Eagle, while Lola! has endured through several iterations. The mirror reflects the transience of all that still exists at Cow Springs Trading Post. If you stop and visit, please view the Cow Springs Trading Post in Tonalea, Arizona as sacred ground. Park your vehicle off the highway and away from the adjacent cattle guard, which delineates a roadway often used by local Navajo residents. Wear sturdy shoes and beware of boards with protruding nails. Although I have never seen a snake there, their presence is possible. Touch nothing, add nothing and take nothing but photos. If Native Americans are present, please show your respect for their culture by staying away from the building. 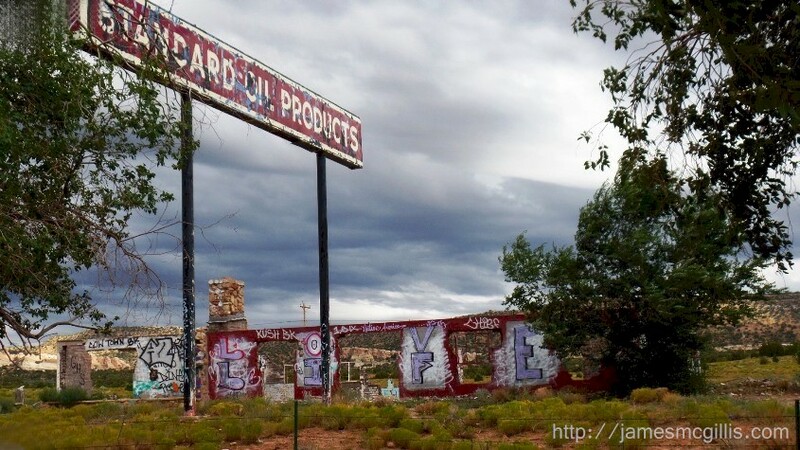 Cow Springs is part of Navajoland, not Disneyland. 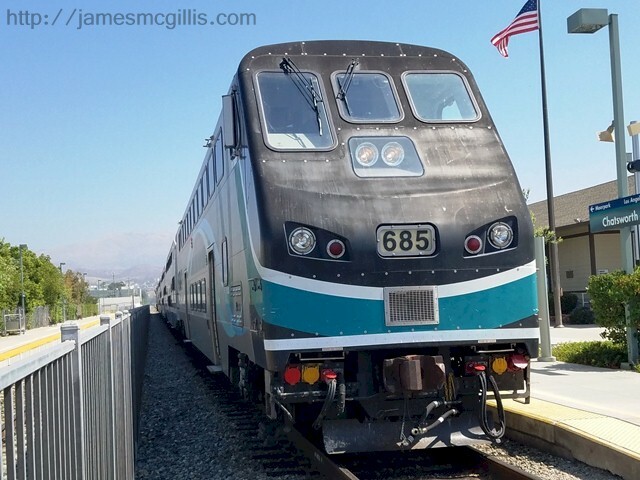 On June 24, 2016, I drove to the Metrolink Station in Chatsworth, California. 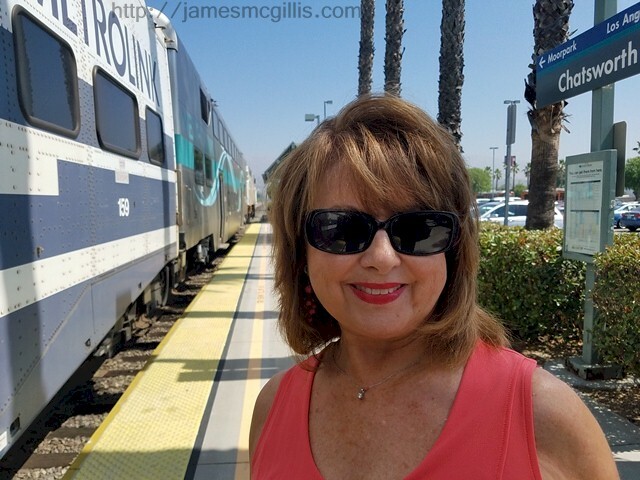 My mission was to drop Carrie McCoy off for her Metrolink ride from Chatsworth to Los Angeles Union Station. Since early 2016, all of the Metrolink trains that I have observed at the Chatsworth Station have been “double-enders”. By that, I mean there is a locomotive at each and of the train. On this occasion, the train arrived in Chatsworth with a locomotive at the “head end” and a Hyundai-Rotem cabcar at the trailing end. In late 2015, as an interim safety measure, Metrolink instituted a second locomotive on each of its trains. The decision resulted from an equipment failure on a Hyundai-Rotem cabcar. In a February 2015 collision in Oxnard, California, the “pilot”, a debris-clearing blade at the front of a Metrolink cabcar, detached. As the pilot disappeared beneath the cabcar, it contributed to the derailment of the cabcar and several other Metrolink coaches. Because of that collision, thirty passengers were injured and Metrolink Senior Engineer Glenn Steele lost his life. The locomotives that Metrolink leased to ride ahead of the Hyundai-Rotem cabcars are massive Burlington Northern Santa Fe (BNSF) freight locomotives. Such locomotives normally pull heavy freight trains on long hauls. Before the Metrolink lease, nowhere in the country have such locomotives pushed or pulled passenger trains. Because of their size, weight and other factors, Metrolink has struggled to safely deploy their BNSF locomotives. A recent Los Angeles Times report indicated that many trains were still running without a locomotive at each end. The original locomotive lease from BNSF was for one year. Even at that, Metrolink now operates them on a Federal Railroad Administration temporary waiver, not a permanent operating permit. By leasing the BNSF locomotives, Metrolink made a de facto admission that heading up a train with a Hyundai Rotem cabcar was inherently unsafe. If so, why is Metrolink still running trains headed up by Hyundai-Rotem cabcars? While at the Chatsworth Station, I walked the platform from south to north. When viewing railroad tracks up close, I like to observe the condition of the infrastructure. Are any of the railroad ties rotten? Are many of the spikes loose? Are palm trees growing up between the rails? At Chatsworth, I found instances of all these deficiencies. Why does any of this matter? If the Philips 66 Santa Maria Refinery has its way, several oil trains each day could pass through the Chatsworth Station on their way to Santa Barbara County. From the June 3, 2016 oil train derailment and fire near Mosier, Oregon, we now know that failure of even one bolt or rail anchor can lead to a catastrophe. As I reached the north end of the platform, I stepped up some wooden stairs to better observe the tracks. As I looked down from there, I could see the milepost marker for that location stenciled on the side of the rail. It read “MP 445.4”, with an arrow pointing down to that exact location. In non-technical language, that means that it is 445.4 miles to the northern terminus of the Coast Line in San Francisco. In addition, that spot is where the wheel truck of an outbound Metrolink locomotive comes to rest at the Chatsworth Station. As I looked more closely, I observed a broken rail anchor lying by the tracks at that exact location. 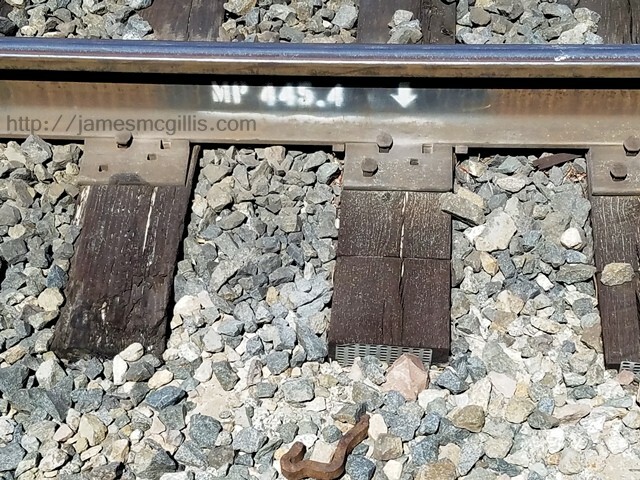 After the Mosier, Oregon derailment, Union Pacific Railroad (UPRR) admitted that despite repeated visual inspections, specifically looking for deficiencies, inspectors missed badly corroded and rusted bolts. In the case of Chatsworth, the Southern California Regional Rail Authority (SCRRA), better known as Metrolink, owns and operates the double-track through Chatsworth Station. Allowing rotten railroad ties, loose spikes and small palm trees to grow between the tracks at the Chatsworth Station is ample evidence that SCRRA is not properly inspecting or maintaining its own rail infrastructure. 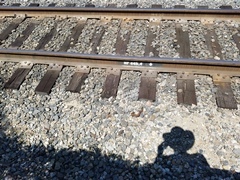 Allowing a broken or detached rail anchor to lie where a 432,000-pound BNSF locomotive comes to rest several times each day is inexcusable. Rather than relying on redundancy to save us all from its next derailment, SCRRA should inspect and repair its infrastructure in Chatsworth and throughout its railroad network. Author’s Note: On July 8, 2016, just two days after the publication of this article, Metrolink announced the impending replacement of fifty-six failure-prone pilots on their Hyundai-Rotem cabcars. 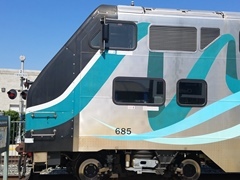 Although the recent lease of BNSF freight locomotives topped $20 million, Metrolink expects to replace the pilot blades for a mere $1.5 million. That would bring the cost of each replacement to $26,785. If the cost to replace the pilots is so low, why did Metrolink not explore that option from the outset?